As you can tell, Four is a major popcorn hog. Once you’ve got your copy and have watched it once (or a few times) we want to know what your favorite scenes and special features are! Make sure you stop by here or tweet us (@DivergentNation) and sound off! Not able to get a copy yet? Lucky for you we’ve got a giveaway for a copy of your own going on right now! You must be 13 years old to enter. This is an International giveaway. To enter, fill out the form below. 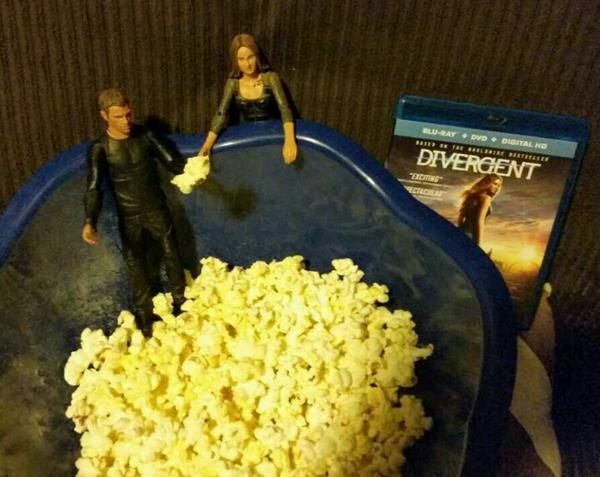 Make sure you come and celebrate release day on twitter by using the hashtag #DivergentDay. Use it to share your favorite scenes, special features, commentary moments, and more! The official Divergent series movie twitter account (@Divergent), our account (@DivergentNation), and lots of other sites will be re-tweeting and interacting with the hashtag all day! Don’t miss out! Definitely the sequence between the end of the choosing ceremony and when Tris jumps onto the Dauntless roof. I’m most excited to see when tris and four meet and the knife throwing sceen! The butter knives scene. The Zipline scene and the Ferris Wheel scene! I’m looking forward to watch Tris’ fear landscapes again. They were so powerful and beautifully filmed! I wasn’t able to see the movie in theaters so I’m just looking forward to seeing the whole thing! I love when Tris first joins the Dauntless and has to jump on the train and into the abyss and meets Four. The jumping off the roof scene. The capture the flag part and the end where Trist breaks Four from the hypnosis and Mrs. Thang gets a dagger in the hand. I wanna watch Tris’ fear landscapes again, they were so intense and beautiful at the same time! I’m exited to watch it ALL! I can’t lie. I can’t choose just one! But if I HAD to, it was probably the Theo James kissing scene lol I’m a sucker for romance. My favorite scene is when tris goes on the zip line and she sees the whole city from way up high, she looks happy and like she is having the time of her life!! I loved the zipline scene! I am most excited to see the knife throwing scene. I loved the scene when Tris and Four were on the train when they were under simulation. I WANT TO SEE ALL OF IT!!!! I HAVENT SEEN IT YET!!! I’m excited to see the whole film because I have not seen it yet. I heard there’s some scene with the characters climbing a Ferris Wheel so I know that will be exciting and scary to watch.